IHG (InterContinental Hotels Group) has signed a management agreement with ACICO Gulf Real Estate to rebrand Nassima Royal Hotel to voco Dubai, marking the first signing of voco, IHG&apos;s new upscale hotel brand, in the Middle East. IHG (InterContinental Hotels Group) has signed a management agreement with ACICO Gulf Real Estate to rebrand Nassima Royal Hotel to voco Dubai, marking the first signing of voco, IHG's new upscale hotel brand, in the Middle East. Hosted by IHG's senior leadership team, the Middle East launch was attended by the wider global voco™ team, including the brand's F&B and design specialists. Globally, IHG launched voco™ in June 2018 to strengthen IHG's offer in the $40 billion upscale segment, which is expected to grow by a further $20 billion by 2025. In the Middle East, the brand is well suited to both new build and conversion opportunities, focused on high-quality individual and locally-branded hotels. This distinctive brand offers owners the ability to drive higher returns through delivering a compelling guest experience and leveraging IHG's powerful systems. Strategically located on the Sheikh Zayed Road and within 8km of Dubai International Airport, voco™ Dubai is the perfect destination for guests to explore the city and offers striking views of the skyline. Designed for both business the leisure travellers, the hotel offers 471 rooms that overlook either the vibrant Sheikh Zayed Road, or the Beach. Amenities include a business centre and 1000 sqm of meeting rooms as well as recreational facilities such as an outdoor swimming pool, a gymnasium, and a spa. The hotel also features multiple dining options including an all-day dining, the lobby bar, a pool bar and 3 restaurants. 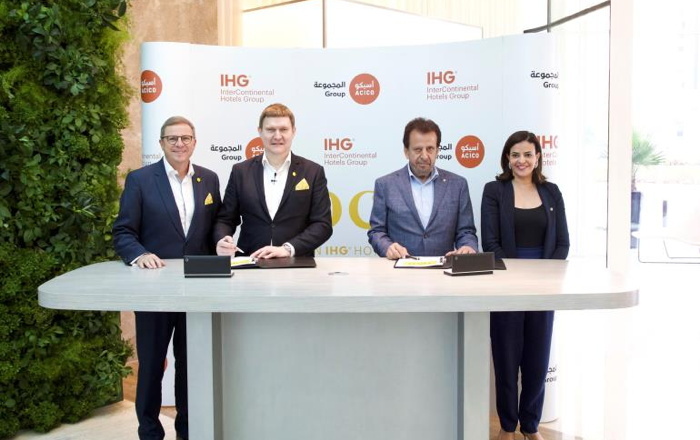 Commenting on the landmark signing, Pascal Gauvin, Managing Director, India, Middle East & Africa, IHG, said: "IHG has identified significant growth opportunities in upscale hospitality and the signing of voco™ Dubai is a significant step in this direction. We are excited to partner with the esteemed ACICO Gulf Real Estate, a subsidiary of ACICO Group to debut the brand in the Middle East and are confident that it will be a popular choice amongst travellers visiting Dubai." He added: "The Dubai market is ever-changing and maturing. In the UAE alone, the unbranded accommodation market makes up 60% of the total hospitality sector. As such, we believe that the Emirate now requires a unique offering like voco™ to cater to mindful and self-determined audiences. voco™ combines the best of individual high-quality upscale hotels, with the best of IHG. It's a brand that forms the heart of a newly built hotel or celebrates what already makes an existing hotel successful. Most importantly, guests can enjoy the freshness of unique hotels under a name they can trust." Ghassan Alkhaled, CEO and Vice Chairman of ACICO Group added: "We are proud to partner with IHG to open the first voco™ in the Middle East. Powered by the strength and scale of the IHG system and charm of the newly launched brand, we are confident that voco™ Dubai will be a great success and a preferred choice for business and leisure travellers looking for an upscale experience." voco, inspired by the meaning 'to invite' or to 'come together' in Latin, promises guests an experience that is reliably different, brought to life through a bold, distinctive identity, informal service style and thoughtful touches along the guests' journey. IHG currently operates 88 hotels across 5 brands in the Middle East, including: InterContinental, Crowne Plaza, Holiday Inn, Holiday Inn Express and Staybridge Suites with a further 30 in the development pipeline due to open within the next three to five years**.